Studies were conducted to compare the structural and thermal properties of pure films of starch and silk protein purified from the web of the pyralid moth, Orthaga exvinacea, a pest of mango tree in India. Silk protein was isolated, purified and introduced into starch solution. The mixture was poured into Petri dishes, to prepare the blended film. The films of pure protein and starch were also prepared. These films were dried and subjected to Fourier transform infrared spectroscopy (FTIR) and Thermogravimetric-differential thermal analysis (TG-DTA). The structural studies showed that the blend film had both the proteineous and saccharide characteristics of silk protein and starch. Even though, the amide II band contributed β-turn structure to the protein, α-helix, most unstable conformation was associated with the same amide band in the blended film. Moreover, amide A and B bands were absent in the blended film. These had been noticed in its thermal properties also. The temperature of maximum degradation of the blend was almost same as those of their respective pure films. The study suggests that for making a structurally and thermally stable film, an increase in the content of protein in the starch solution is necessary. Moreover, the optimization of various processing conditions may result in the formation of a blend, which is the most apt one for the non-textile industry. Natural fibres are used in various spheres of human life. Silk is a natural fibre, secreted by insects and spiders , which has been used in the formation of cocoon, nest building, traps, web formation, safety line formation and protection of eggs [2,3]. The contribution of silk in the textile industry is mainly from the lepidopteran families, Saturniidae and Bombycidae. Ever since the history of human civilisation, silk has been mentioned as an agricultural product. Silk proteins are synthesized in the modified labial glands, secreted by silkworm during the last larval instar by moving its head in a particular manner. The liquid silk proteins in the silk glands are subjected to various mechanical stresses during these movements. Finally, it comes out through the spinneret and gets transformed into silken fibres of excellent mechanical properties . The fibroin and sericin are the two major silk proteins, the fibroin form the core of the silk fibre and sericin function as a glue cover around it [5,6,7]. In addition to these, silk fibres consist of salts, waxes and ashes. The fibroin protein is composed of a heavy chain and a light chain having a molecular weight of about 350 kDa and 25 kDa respectively [8,9]. The spider silk spidroin proteins have a molecular weight of 70 to 700 kDa. An interesting feature about the mulberry and spider silk is that they are rich in glycine, alanine and serine . The insolubility of silk fibroin in water is attributed to the irreversible phase transition of proteins during spinning. A few researchers have observed the solubility of the silk fibres using expensive organic solvents such as NMMO, TFA and HFIP [11,12,13]. The most successful solvents for the dissolution of silk fibroin was found to be the neutral salt solutions such as LiBr and LiCNS [14,15]. In the past few decades, research has been focused on various applications of silk in the non-textile industries. As per requirements, silk fibroin can be regenerated in various forms like membrane , films [17-19], powder , scaffolds [21,22] and matrices . Various studies had revealed that silk proteins show excellent reproducibility, environmental and biological compatibility, non-toxicity and biodegradability [24-26]. These properties of silk make its possibilities in the various areas of biomedicine and biotechnology. There is a major change in the conformatory characteristics associated with fibroin during its processing. These changes have made the regenerated silk more fragile and brittle, but the structural and chemical properties of silk can be improved by blending with various polymers such as chitosan , cellulose , starch , sodium alginate etc  These blends have wide applications in the non-textile fields. In the present decade, researchers have turned their attention to the silk produced by different insect groups and other arthropods. In this circumstance, proteins extracted from the silken web of the mango leaf webber, O. exvinacea has immense importance. O.exvinacea is easy to rear and resistant to various diseases making it an excellent alternative to the mulberry silkworm. A part from this, a detailed characteristic study of silk protein of O. exvinacea, its biocompatibility and modifications are necessary for making its utilization effective and widespread in the biotechnological and biomedical fields. The present study is focused on the preparation of a blend film from regenerated silk protein of O.exvinacea and starch. The structural and thermal analysis of purified web protein from O.exvinacea, pure starch and a blend of these two were done on the films prepared from the respective materials using FTIR and TG-DTA. The larvae of O.exvinacea were collected from Kozhikode and Malappuram district of Kerala and reared in the insectary. During the larval period, the silk, extensively secreted by the organism was in the form of discontinuous threads entangled with excretory pellets. The web was collected from the cages, cleaned and subjected to degumming. After degumming in 0.05% sodium carbonate, the web was washed in boiling water and air dried for 20-24 h. The dried web was dissolved in saturated solution of lithium bromide. The solution was dialysed against distilled water to get purified proteins. Starch solution 1% (w/v) was prepared by dissolving 1 g of pure starch in 100 ml of distilled water and the solution was heated to about 40°C to ensure its solubilization. The two solutions, i.e., web protein and starch were mixed in 1/9 ratio using magnetic stirrer at a speed of 100 rpm for 10 min. The blend film was prepared by casting a volume of 1% mixed solutions into a Petri dish. Similarly, pure films of starch and web protein were also prepared. The Petri dishes were transferred into a desiccator containing activated silica gel. For drying the films, the reactivation of silica gel was done on a daily basis until the films automatically peeled off from the dishes. The FTIR spectral analyses of the films were done using JASCO-4100 instrument. The infrared spectra of the films were recorded at the frequency in range of 4000 to 400 cm-1 at room temperature with the resolution of 4cm-1. The films (1.5 mg) were heated non-isothermally from 40 to 500°C at a heating rate of 10°C /min using Perkin Elmer STA- 6000 instrument (USA). The overall process was carried out in the inert atmosphere, which was maintained with nitrogen at a flow rate of 200 ml/min. The secondary structural studies of pure web protein films had shown amide I band at 1650 cm-1, amide II at 1529 cm-1, amide III at 1243 cm-1 and amide IV at 649 cm-1 (Figure 1). In addition to that the spectrum of web protein film had two other amide bands i.e., amide A and amide B. 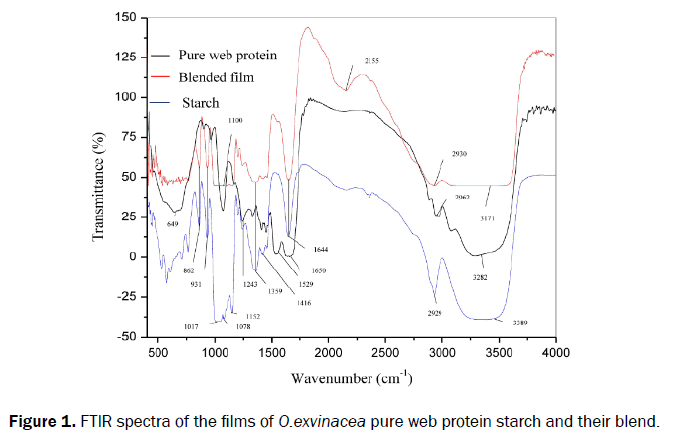 Figure 1: FTIR spectra of the films of O.exvinacea pure web protein starch and their blend. The spectrum of starch (Figure 1) showed characteristic saccharide absorption bands, which were at 3389 cm-1, 2929 cm-1, 1416 cm-1, 1152 cm-1 and 931 cm-1. In addition to it, absorption bands were seen at other frequencies. They were at 1644 cm-1, 1456 cm-1, 1359 cm-1, 1243 cm-1, 1204 cm-1, 1078 cm-1, 1017 cm-1, 862 cm-1 and 763 cm-1. The blend with ratio of 1/9 showed amide I band at 1644 cm-1 and the amide II band came at 1542 cm-1 (Figure 1). In the spectrum, amide III band was seen at 1244 cm-1. The amide A and B were totally absent in the spectrum. Other important bands related to saccharides noticed in the spectrum, were at 2930 cm-1, 1422 cm-1, 1100 cm-1 and 931 cm-1. Similar to the pure films, this spectrum also showed additional absorption bands at 3171 cm-1, 2155 cm-1, 1359 cm-1, 1205 cm-1, 862 cm-1and 768 cm-1. Thermogravimetric curves of the films gave information about its thermal stability (Figure 2). All films experienced a weight loss of about 8% at 100°C. The web protein/starch (1/9) blended film and starch films lost almost 10% of its weight with temperatures between 100°C and 250 oC (Figure 2). But loss of weight of the pure web protein film was twice as that of blended and starch films. At the temperatures of 300°C and 350°C, a substantial loss of weight had been noticed which was 36%, 42% and 47% for pure web protein film, starch and blended film respectively. The DTG curves of the films gave information about the temperature of maximum degradation (Figure 3). In the case of blended film, it was almost same as that of pure web protein film. The residual weight of the pure protein film and starch were 4% and 5% respectively at temperatures beyond 500°C. Whereas in the blended film (web protein/starch), nothing was left beyond this temperature. 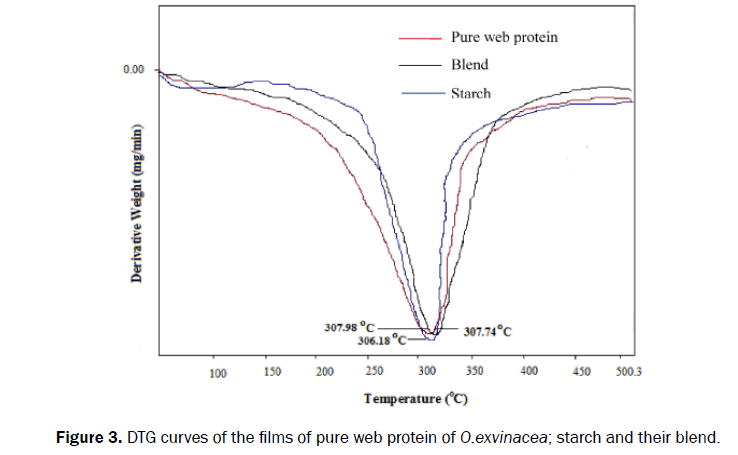 Figure 2: Thermogravimetric curves of the films of pure web protein of O.exvinacea; starch and their blend. Figure 3: DTG curves of the films of pure web protein of O.exvinacea; starch and their blend. FTIR is an appropriate technique for studying the secondary structure of protein. The conformational characteristics of protein and polypeptides were decided by the vibrations of amide groups in it. The stretching vibration of C=O is responsible for the formation of amide I band, which come in between the wavelength of 1700 cm-1 and 1600 cm-1. On the other hand, the amide II band arises from the C-N stretching and N-H bending vibration. This absorption band falls in range of 1229 cm-1 -1301 cm-1 [31-35]. The characteristic amide bands of protein film of O. exvinacea (Figure 1), appeared at frequencies of 1650 cm-1, 1529 cm-1 and 1243 cm-1, are assigned to random coil, and unordered with β-turns and β-sheet conformation. The spectral analysis of web protein/starch blended film showed the characteristics of both of them. Generally amide bands are the most sensitive bands seen in protein and peptides. The blend film with 1/9 ratio (Figure 1) showed with a peak frequency of 1644 cm-1, have random coil conformation same as that of pure protein film in agreement with [36,37]. It is presumed that the water molecules absorbed in the amorphous region of the pure starch film give rise to the absorption peak at 1644 cm-1 as has been reported in the case of spectrum obtained for native starch film from Plectranthus esculentus by Kemas . Another sensitive band, i.e., amide II, seen at 1529 cm-1 in the spectrum of pure protein film contributes β sheet conformation, had shifted to a frequency of 1542 cm-1 in the film with 1/9 ratio and produce a less stable α-helical conformation (Figure 1). On the other hand, the pure starch film, which is a polysaccharide, is completely devoid of the amide II band. The structural characteristic associated with the amide III band of the blend is same as that of pure web protein film. The blended film exhibits characteristic saccharide bands. As the amide A and B bands were absent in the spectrum of blend film of 1/9 ratios. These spectral changes may be due to the interaction of sugar and protein molecule. These interactions might bring conformational changes in the blended films as compared with their pure films. A broad absorption band which is having a wave number of approximately 2929 cm-1 noticed in the spectra of both pure starch and blended film is due to O–H and C–H stretching vibration. The absorption band at frequency of 1000 cm-1 -1155 cm-1 in the pure starch film and blended film may be attributed to the saccharide structure of starch [39,40]. In this study, the blending of web protein from O. exvinacea into the starch film had improved its thermal stability. A similar report was seen in the thermal studies on the films of pure chitosan, eri silk fibroin/chitosan and pure eri silk fibroin. Prasong , who observed that the introduction of eri silk fibroin into chitosan had brought higher thermal stability than pure chitosan film. However, the lowering of thermal stabilities was observed in the blends from the silk fibroin of B. mori and starch by Srihanam. The comparative structural and thermal properties of Orthaga exvinacea web protein/starch blend and their pure films were carried out using FTIR and TG-DTA. The structural characteristics showed that the blend film had a combination of protein and saccharide properties. It is interesting to note that the structural characteristics associated with the amide bands of blend film are stable β-sheet, random coil and α- helical conformation. A decrease in the content of β-sheet and β-turn has been noticed in blend film in comparison with pure web protein film. Moreover, the blended film lacks amide A and B bands. These changes in structural properties have a major impact on the thermal properties of the blend film, which showed the same temperature of degradation as those of its pure web protein film. This may suggest that the increase in the content of protein in the blend, might improve its structural and thermal properties. The study thus provides leads to the preparation and application of blends of biomolecules in biotechnological and biomedical fields. Further optimizations are required for the preparation and characterization of various blends and their use in various fields. Authors acknowledge the financial support and facilities provided by university of Calicut to enable us carry out the experiment. Special mention is given to Selective Augmentation of Research and Development (Thiruvananthapuram), Sophisticated Test and Instrumentation Centre, Cochin University of Science And Technology for TG-DTA analyses. Kaplan DL, et al. Silk: biology, structure, properties and genetics. In: Silk polymers: Materials Science and Biotechnology. ACS Symposium Series. 1994;544:2-16. Kaplan DL, et al. Silk. In: Protein Based Materials. Birkhauser, Boston, 1998;103-131. Wong P, et al. Genetic engineering of fibrous proteins: Spider dragline silk and collagen. ‎Adv Drug Deliv Rev. 2002;54:1131-1143. Vollrath F and Knight DP. Liquid crystalline spinning of spider silk. Nature. 2001;410:541-554. Magoshi J, et al. Biospinning (Silk fibre formation, multiple spinning mechanisms). In: Polymeric Materials Encyclopedia. Salamone JC (Eds), CRC Press, Boca Raton, FL, USA. 1996;1:667-679. Dash R, et al. Isolation, purification and characterization of silk protein sericin from cocoon peduncles of tropical tasar silkworm, Antheraeamylitta. Int J BiolMacromol. 2006;38:255-258. Dash R, et al. Purification and biochemical characterization of a 70 kDasericin from tropical tasar silkworm, Antheraeamylitta. Comp BiochemPhysiol B BiochemMol Biol. 2007;147:129-134. Yamaguchi K, et al. Primary structure of the silk fibroin light chain determined by cDNA sequencing and peptide analysis. J Mol Biol. 1989;210:127-139. Zhou CZ, et al. Fine organization of Bombyxmori fibroin heavy chain gene. Nucleic Acids Res. 2000;28:2413-2419. Kirimura J. Studies on amino acid composition and chemical structure of silk protein by microbiological determination. Bull SericExpStn. 1962;17:447-552. Um IC, et al. Wet spinning of silk polymer I. Effect of coagulation conditions on the morphological feature of filament. Int J BiolMacromol. 2004;34:89-105. Ha SW, et al. Distinctive influence of two hexafluoro solvents on the structural stabilization of Bombyxmori silk fibroin protein and its derived peptides: 13C-NMR and CD studies. Biomacromolecules. 2006;7:18-23. Corsini P, et al. Influence of the draw ratio on the tensile and fracture behaviour of NMMO regenerated silk fibres. J PolymSci B Polym Phys. 2007;45:2568-2579. Lizuka E. Silk thread: Mechanism of spinning and its mechanical properties. J ApplPolymSciSymp. 1985;41:173-185. Tsukada M, et al. Physical and chemical properties of tussah silk fibroin films. J PolymSci B Polym Phys. 1994;32:1407-1412. Minoura N, et al. Physico-chemical properties of silk fibroin membrane as a biomaterial. Biomaterials. 1990;11:430-434. Minoura N, et al. Attachment and growth of fibroblast cells on silk fibroin. BiochemBiophys Res Commun. 1995;208:511-516. Acharya C, et al. Silk fibroin protein from mulberry and nonmulberry silkworms: cytotoxicity, biocompatibility and kinetics of L929 murine fibroblast adhesion. J Mater Sci Mater Med. 2008;19:2827-2836. Kundu J, et al. Mulberry non-engineered silk gland protein vis-a-vis silk cocoon protein engineered by silkworms as biomaterial matrices. J Mater Sci Mater Med. 2008;19:2679-2689. Hino T, et al. Change in secondary structure of silk fibroin during preparation of its microspheres by spray-drying and exposure to humid atmosphere. J Colloid Interface Sci. 2003;266:68-73. Wang Y, et al. Stem cell-based tissue engineering with silk biomaterials. Biomaterials. 2006;27:6064-6082. Mauney JR, et al. Engineering adipose like tissue in vitro and in vivo utilizing human bone marrow and adipose derived mesenchymal stem cells with silk fibroin 3D scaffolds. Biomaterials. 2007;28:5280-5290. Park WH, et al. Effect of chitosan on morphology and conformation of electrospun silk fibroin nanofibres. Polymer. 2004;45:7151-7157. Ning L, et al. Explorations on correlation of biological tests of skin reproductive membrane. China J Mod Med. 1999;9:2. Foo CWP, et al. Genetic engineering of fibrous proteins, spider dragline, silk and collagen. Adv Drug Deliver Rev. 2002;54:1131-1143. Altman F, et al. Silk-based biomaterials. Biomaterials. 2003;24:401-416. Prasong S, et al. Influence of Philosamiaricini silk fibroin components on morphology, secondary structure and thermal properties of chitosan biopolymer Film. Pak J Biol Sci. 2009;12:1266-1271. Marsano E, et al. Regenerated cellulose-silk fibroin blends fibres. ‎Int J BiolMacromol. 2008;43:106-114. Srihanam P. Silk Fibroin/Starch Blend Films: Preparation and Characterization. Biotechnology. 2011;10:114-118. Lee KG, et al. Structural and physical properties of silk fibroin/alginate blend sponges. ‎J ApplPolym Sci. 2004;93: 2174-2179. Elliott A, et al. Structure of synthetic polypeptides. Nature. 1950;165:921-922. Miyazawa T, et al. Characteristics infrared bands of monosubstituted amides. J. Chem. Sci. 1956;24:408-419. Krimm S, et al. Vibrational spectroscopy and conformation of peptides, polypeptides and proteins. Adv Protein Chem. 1986;38:181-364. Banker J. Amide modes and protein conformation. ‎BiochimBiophysActa. 1992;1120:123-143. Bramanti E, et al. Solid state 13C NMR and FTIR Spectroscopy of the cocoon silk of two common spiders. SpectrochimActaMolBiomolSpectrosc. 2005;62:105-111. Tretinnikov N and Tamada Y. Influence of casting temperature on the near-surface structure and wettability of cast silk fibroin films. Langmuir. 2001;17:7406-7413. Hu X, et al. Determining beta-sheet crystallinity in fibrous proteins by thermal analysis and infrared spectroscopy. Macromolecules. 2006;39:6161-6170. Kemas UC, et al. Effect of chemical modification on the proximate composition of Plectranthusesculentus starch and characterization using FTIR spectroscopy. World J Pharm Res. 2012;1:1234-1249. Mundargi RC, et al. Formulation and in-vitro evaluation of novel starch-based tableted microspheres for controlled release of ampicillin. CarbohydrPolym. 2008;71:42-53.